Pictured from left to right: Sumara Thompson-King, NASA General Counsel; Marco Ferrazzani, The Legal Counsel for the European Space Agency; S&H Attorney Skip Smith; and, Tanja Masson-Zwaan, the President of the International Institute of Space Law. 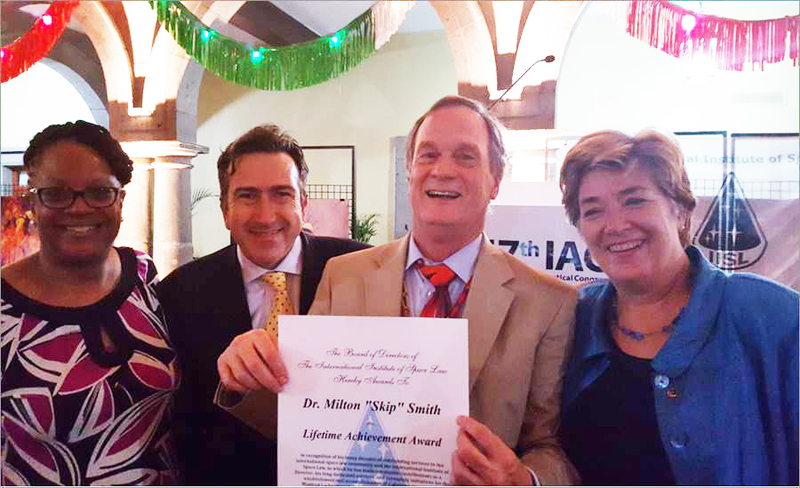 October 12, 2016 – Sherman & Howard Attorney Skip Smith received a Lifetime Achievement Award at the International Institute of Space Law (IISL) Annual Awards Dinner in Guadalajara, Mexico, on September 29, 2016. Space law is an area of the law that encompasses national and international law governing activities in outer space. Smith is one of sixteen space industry leaders and lawyers on the Board of Directors of the International Institute of Space Law and is a former Chair of the Colorado Space Business Roundtable. He has been with Sherman & Howard since 1993 and is a member in the firm’s Colorado Springs office. Smith has held several significant space law leadership positions, including having served as both Director of Space Law at U.S. Space Command and Chief of Space Law at the Pentagon’s Air Force Headquarters. He also served in Geneva as the Legal Advisor of the 50-person U.S. Delegation at the International Telecommunication Union Conference on the Geostationary Satellite Orbit. The International Institute of Space Law was founded in 1960. The purposes and objectives of the Institute include the cooperation with appropriate international organisations and national institutions in the field of space law and the carrying out of tasks for fostering the development of space law. It also includes the studies of legal and social science aspects of the exploration and use of outer space and the holding of meetings, colloquia and competitions on juridical and social science aspects of space activities.